Colleagues notice how you dress. Dressing professionally in the workplace shows others you are serious about your career. Wearing jeans and a T-shirt may be comfortable, but it projects an inexperienced and unrefined image. 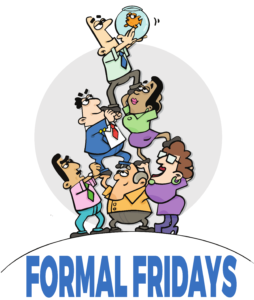 “Formal Fridays” is a strategy designed to stand out visually from others to maximum effect. Most professionals dress well Monday through Thursday and dress casually on Friday. Be a contrarian and reverse that trend. Dress casually during the week and, instead of dressing down on Fridays, dress UP! Skip the polo shirt and sneakers and don a tailored shirt with a power tie. Monday through Thursday, dress more casually than average. Do not underdress! When dressing up, go one noticeable notch above others, but not too far. Wearing a tuxedo or a ballroom dress while everyone else is in sneakers is going overboard. Like many strategies in this book, Formal Fridays enhance your workplace visibility. 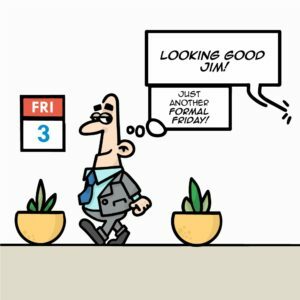 By dressing more formally than your peers on Fridays, you will be noticed. “Looking good, Nate!” “Dressing sharp today, Ellen!” These types of compliments are fun and build self-esteem. More importantly, your professional appearance identifies you as someone serious about his or her professional career.